When you first meet Ryan Wyckoff, you are immediately struck by his youth, his intensity, his smile, and his height. Of course “youth” is gauged by those doing the observing, and with most of those in the cluster of members shaking hands of introduction in the lobby, all being “well past middle age,” everyone younger than 45 seems youthful. 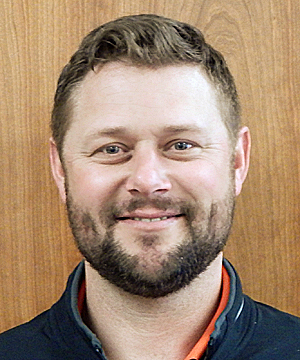 But, when you take a look at Ryan’s resume, it’s clear that he has packed a lot of impressive experience into a career that began in 1997, with a Bachelor of Science in Turf Management from Oregon State, and has taken him through some of the best-known courses and tournaments in golf. Starting as an Assistant Superintendent at the Links at Spanish Bay, Pebble Beach, then on to Pebble Beach Links, Loomis Trail Golf Club in Blaine, WA, and then to a long stay as Superintendent, and then Senior Director of Golf Operations at the OGA Course in Woodburn, Ryan has been involved with a wide range of weather and course conditions. Add to that, tournament experience with a long list of events, including three U.S. 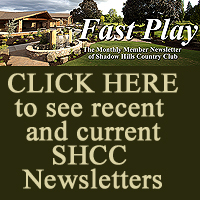 Opens, several state and regional invitational, and U.S. and amateur tournaments, and you begin to understand why bringing him here to Shadow Hills introduces a level of excitement and hope for “next level” quality. I had the chance to chat briefly with Ryan after he had a chance to do a basic assessment of our course, and to get his impressions of what he was seeing. NOTE: A “Meet and Greet” event for Ryan, has been scheduled for Saturday, March 12th at 2PM in the dining room. You are all welcome to attend. With our weather conditions being somewhere in the middle of these, what kinds of things do you see as being the challenges of providing a great golf experience in any weather condition? Ryan: They’ve done a pretty good job of dealing with drainage in the past, but there are some areas that have become noticeable in the heavy rain. Water in the bunkers is one thing, but this course also has a lot of trees, so we’re out daily cleaning up debris that falls into the course fairways and greens. I was at the OGA course for 13 years, and the weather isn’t that different, so I have a pretty good idea as to what we need to do to improve things. 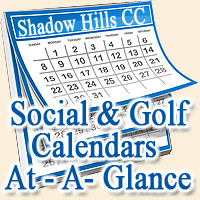 PM: What were your first impressions of Shadow Hills in regards to the course, and the facilities? Ryan: You know, I’d never been to Shadow Hills before. I’d never played the course or even been to the clubhouse. But I was impressed. It’s a great course, and obviously the new club house is a great facility, and having the outside gardens for weddings and banquets is really nice. It’s an added amenity that a lot of golf courses don’t have. As far as conditioning, I think the course is pretty good, but it’s about taking the course to that next level, and perception-wise, make it a little more of that Country Club feel. A lot of that is just attention to detail, and trying to make sure that everything always has a clean, tight appearance, not sloppy around the edges. But, I think it’s going to be a good opportunity, I’m excited about it. PM: If there was a basic phrase or overarching mission statement that you want to instill here in regards to our course, what would it be? Ryan: I guess the overall goal is to have Shadow Hills be one of the best maintained courses in the state. You talk about Private Clubs…and I’d like to be right there with some of the clubs in Portland, and I think with just some attention to details and fine tuning, we can do that. We have a good golf course, “the bones are there.” But, yeah…I’d want to build a reputation that we’re the best maintained golf course in the state of Oregon. PM: Rumor has it, you have already deemed our greens as “needing improvement.” What jumped out at you? Ryan: So, we’ve got a couple of greens…#9 is probably the worse, but # 10 and #18 as well, is that after we some rain, they’re holding too much water, but we also get some bubbles. It’s almost like some air pockets in some of the greens. I’ve cut down into the profile on some of those, and there’s just a real lack of root structure there. It’s almost like a piece of sod, floating there. Those roots really aren’t holding the turf to the sand soil structure. We’re probably going to do some things agronomically, using some amendments, like phosphorous to try to promote stimulated root growth. And maybe some cultural practices like deep tine aerification, to try and get that water to drain farther into the soil. We’ll need to have them ready for the heavier traffic and low mower cuts of the summer months as well. But this was pretty noticeable with the weather we’ve had recently. PM: Several of the courses you have been involved with are Audubon certified. As you know…we are in the final stages of our own certification. What has your experience been in relation to the advantages and challenges of being an Audubon Certified course? Ryan: Well I went through the process of certification at the OGA in 2004, and they provide guidelines for what they’d like to see in different aspects recommendations for the course. We went through it there, just to make sure that people knew me maintained the course in an environmentally friendly manner in regards to water quality and consideration of wildlife. But, as you say, here at Shadow Hills, we’ve already done most of that and are really just waiting for the final certification. Jake’s done a great job of that, getting everything prepared and submitted. Some people kind of have the impression that the Audubon dictates what you have to do on the golf course, which really isn’t the case. It’s really up to each superintendent as to how much they really want to do, so there is a lot of flexibility I guess. PM: Do you see any immediate changes you would like to make this year? Ryan: Well, my first tour of the golf course, I saw that the cart paths are in terrible condition. But I think that is something the Board has already addressed for the near future. It definitely needs to take place. It just gives it a much more clean look. I mean right now, there are pothole everywhere, and water everywhere. And that really makes a difference a far as the look and quality of the course. We’re going to do some more landscaping throughout the course, that has the same theme, and ties in with the landscaping around the clubhouse. We’re going to take that out onto the course. It will be nice to have some color out there, and give it a little more of a high end appearance, a little more of a country club feel. And then there are a few maintenance practices that we’d like to implement. We’d like to start doing intermediate cuts along the fairways (deep, intermediate, shorter). We’re going to walk mow the greens, and talking about hand raking the greenside bunkers, to give them a little better quality rake job. A lot of them are just everyday maintenance practices that will improve playability and quality. Ryan: Well…working at Pebble, and working a few of the USGA major events, the USGA recommends 4 inches of sand on the base, so along the flat levels of the bunker, and 2 inches on the edges. This means that if you hit a shot in, you don’t have a bunch of sand that creates a “fried egg” on the edge, but the ball releases and rolls down into the middle of the bunker. I’ll be out doing some probing of depth, because you really don’t want too much or too little, so you aren’t grounding your club and have an even lie. PM:Your experience includes involvement in a long list of Major and Prestigious tournaments- Do you see an opportunity for our club to attract regional or national golf tournaments? RyanL Yeah! I do. I mean, a Private Club is a little different, because the membership has a lot to say about whether they want to host and give up their course for a length of time. But I think as far as the quality of course…I mean they had a Nationwide here for years, so it’s obviously a good enough golf course to host some high profile events. I always think it’s nice to have the reputation of having a course nice enough to do that. PM: Are you and your wife looking to move into the area? Is this something that will be in the future for you? Well, my wife and I live South of Salem now, in the Turner/Jefferson area, so right now it’s about a 45 minute commute, and before I had about a 30-35 minute commute to the OGA, so it’s really not that much different. Plus, my eldest daughter (he has two) is in High School, and she’s not real excited about moving quite yet. So, for the time being, I’ll probably just be commuting and staying where we are. PM: Well, we are all very excited to have you here, and it sounds like some great changes and improvements are coming. Ryan: I’m very happy to be here, and really excited to get started!